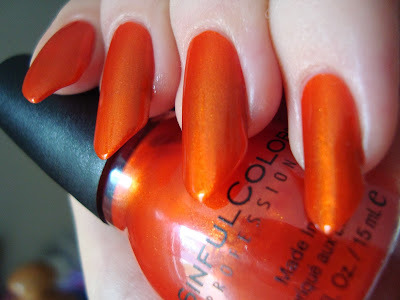 Sinful Colors has a few different Halloween displays out this year, so it's tough to give a more specific name to today's post. If you're lucky, you'll find the HUGE haunted house display at Walgreens. It has a big variety of stripers, a bunch of rereleased shades, one new shade, a new glow in the dark polish, and new applique stickers. (I only just found that display yesterday, so I don't have a swatch for Glow In The Dark yet.) The Walgreens shelf display has the new shade, but not the glow polish or the appliques. There's also a shelf display at select regional stores (like Wegmans), with the new shade and a variety of other black and orange shades, including a black striper. The new shade, Black Magic, is worth tracking down. Overall, the displays have a pretty wide variety of black, green, purple, orange, and red core or repromoted shades. I put together a little compilation of some to go along with two new swatches. 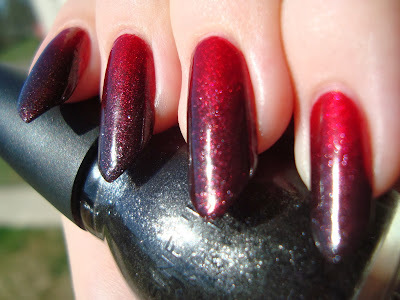 For the previously swatched shades, please click the shade name to read my older review. Black Magic has gunmetal gray microglitter and small orange hexagonal glitter in a clear base. one coat over OPI Did You 'ear About Van Gogh? How cool is this? Frequent readers will already know how much I like it, since it was the prize for Wicked Winnings Wednesday #2. If you haven't put your name in the hat for the Fantasy Makers paper eyelashes, get to it! You only have until 12am Wednesday. There aren't a ton of entries in yet, so your chances are pretty good! Back to the matter at hand though...the review. I'm so tangent-y today. Black Magic is a dupe for an older Piggy Polish shade called Lightmare, so it's not entirely unique...but it's unique in my collection of over 1300. I don't have anything else remotely like it. 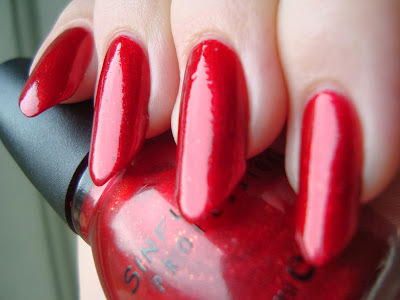 Beyond that, it applies smoothly and evenly without the need for dabbing or placing and isn't terribly topcoat-thirsty. There are only two types of glitter in this mix, but it manages to look complex anyway. 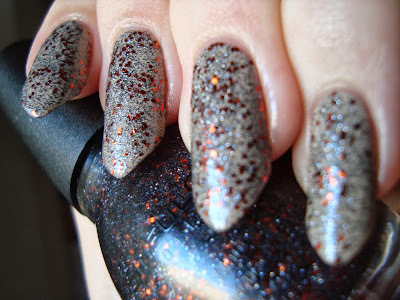 Sometimes you'll notice the orange more, but the gunmetal catches the light just right sometimes and twinkles. 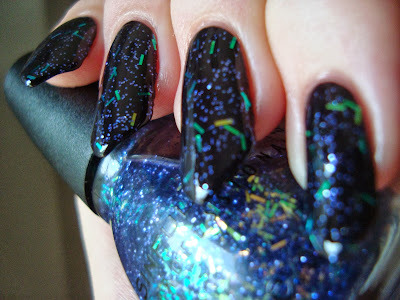 I wore Black Magic over OPI Did You 'ear About Van Gogh? because I worried about covering the patch on my index nail. I think I was being overly cautious. It apparently builds up just fine in 2-4 coats, depending on your application and nail length. Still, it's good to see how well it layers. I added a second coat and liked it even more. two coats over OPI Did You 'ear About Van Gogh? The second coat adds depth to the complexity. 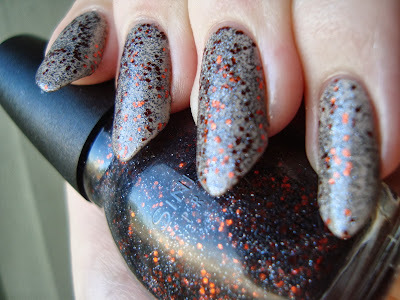 It's so pretty this way that it must really be something worn at 3-4 coats alone. I mattified it too, which really made the orange leap right to the front. 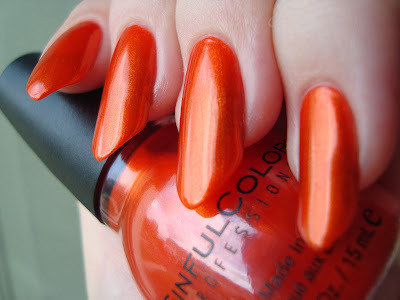 Courtney Orange is a glowing orange shimmer. Some of you might remember how Daredevil had me kinda wishing I liked pink. Now it's orange's turn. Courtney Orange is so thoroughly not my kind of color, but...hot damn! It's a little on the sheer side, taking three coats for complete coverage on my nails, but it's forgivable. I was going for Halloween, but the result is more 'team colors'. Clemson, to be exact. I googled. 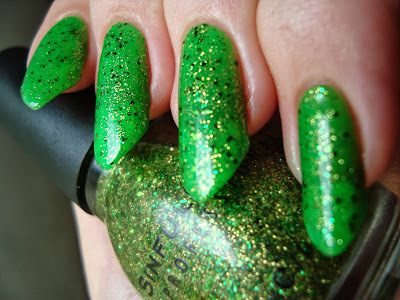 I already had Irish Green and Call You Later from St. Patrick's Day, but I hadn't worn them together before. This is why I wish I'd tried Black Magic on its own. You can't see the patch here. Oh well. Not like it's going anywhere. I sandwiched this combo with another coat of Irish Green, but I liked it more before. Oh well there too. Inkwell isn't actually black, but you have to look close to tell. 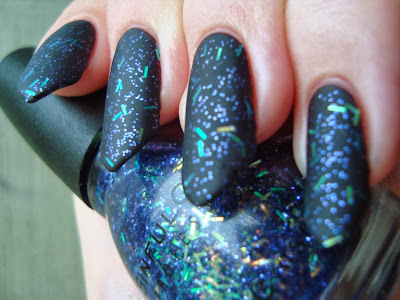 I swatched Inkwell before as part of Haute Rebel, but it was also part of last fall's Enchanted/Muse. Some of the other shades from that collection have turned up in some of the Halloween displays this year, which is awesome. That's still one of my favorites from them and I hope more of them return sometime. Back to Inkwell, it really is purple...I swear....but it comes off as soft black most of the time. 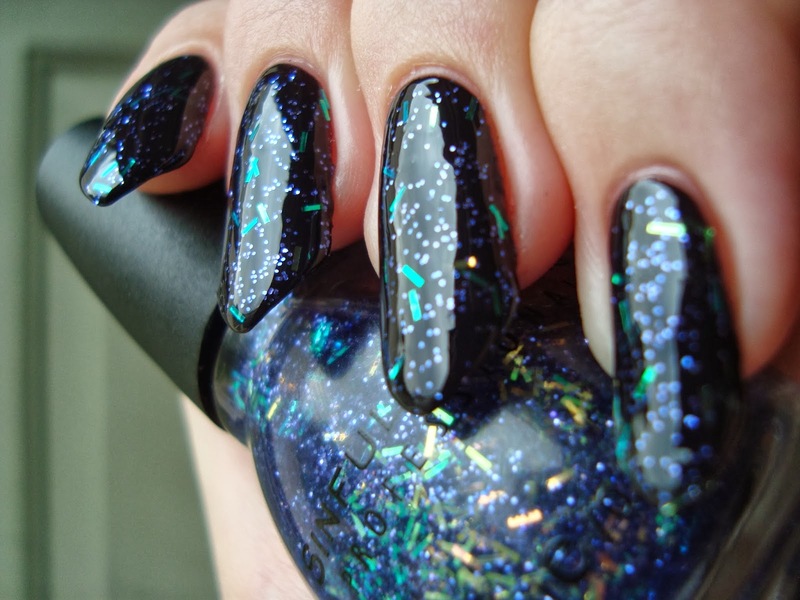 Faceted has a mix of small periwinkle round glitter and short, thick iridescent bar glitter in a clear base. My gateway bar glitter...though I still don't love the stuff. (I still can't get myself to buy any that are 100% bars, no matter how many colors they put out.) Last year I had a tough time finding a base for it, but live and learn, right? This time around, I didn't sponge it on. Instead I dabbed and placed the bars with the brush. Sugar Sugar has sparse gold microflecks in a red shimmer base. I wasn't that happy with my first crack at swatching Sugar Sugar, and I don't love how it turned out this time either. It's a tough shade to capture. Google it and see what I mean. It's a very glowing red, in a way that cameras struggle with. It's also got little bits of gold microfleck, which you can see better in the bottle in my photo. They're there on the nail too though. Sugar Sugar is one of my favorite reds and I paired it with one of my favorite blacks, Secret Admirer, for a gradient....which you may have already seen. See it again! Bottom line: These aren't all of the shades you might find in the various displays. I also saw Black On Black, All About You, and Last Chance, among others. There isn't a single shade in this post that I wouldn't recommend, especially with the 99c sale on. And now the apology. They did eventually reply to me, thankfully, and I appreciate it. It turns out that the "sinfulcolorsprofessional" Instagram account is not associated with the brand. I'm sorry that I lept to the same conclusion as so many others. Whoever manages that account has since added a disclaimer...and removed my photos. They still post photos taken by others without credit. It's still wrong. The brand was wronged by this misrepresentation too, and I hope they take the matter up with Instagram and/or whoever's running that account. They have also strongly hinted that they'll soon have an account of their own on Instagram! Yay! I love the gradients that you did. Gorg!!! Cool gradients, and I'm suddenly motivated to go check out the halloween displays again! lol Thanks! :) In a pretty sparse Halloween, at least they put out a good assortment. 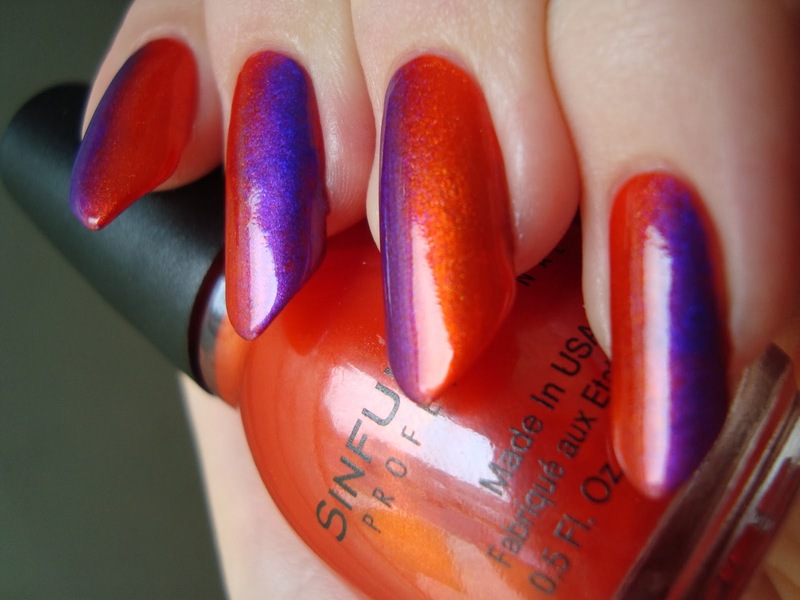 Your gradients are always so awesome! Black Magic & the GITD are my 2 favs from this year's release! 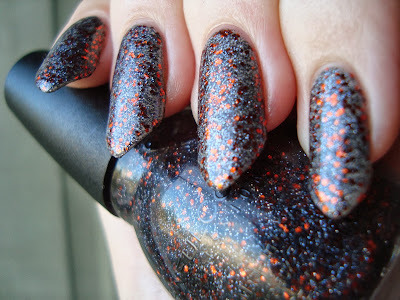 The GITD is the best one I've ever worn...I even tested it against China Glaze, Black Heart Beauty & Halloween store GITDs. Oh wow! Hope I have time to swatch it soon! With the exception of the green shades, I bought all of the same colors. 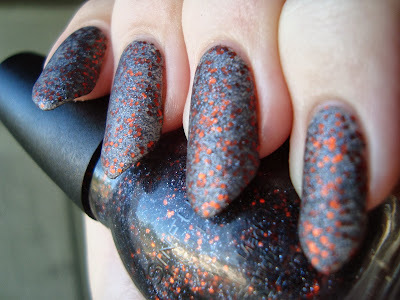 I've only played around with 3 of them so far....Sugar Sugar, Faceted and Let's Talk I've been saving Courtney Orange and Black Magic for *right* before Halloween. 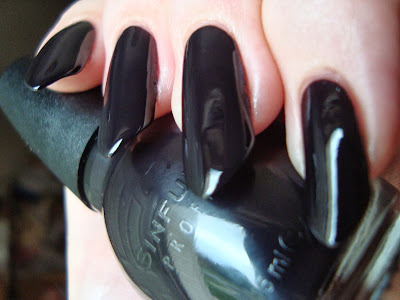 Inkwell very much reminds me of a color Avon did a few (like 8) years ago when I was a rep called Warm Black. Between Walgreens 99 cent sale and Big Lots having Sinfuls for $1....I should be able to expand my collection nicely! All of these looks are so gorgeous! I'm jealous of your gradient skills.